Roguelike action RPG game with adventure elements, in which we get to the universe known from the mythology of Cthulhu. Lovecraft's Untold Stories is a roguelike action RPG game enriched with adventure elements. The game was developed by independent Russian studio Blini Games. The story is set in the universe revolving around the Cthulhu Mythos concieved by the works of famous H.P. Lovecraft. In Lovecraft's Untold Stories players can assume the role of one of the five characters - a private detective, a thief, a professor, a witch, and a ghoul. Each of them has their own investigation to conduct in locations inspired by stories of a loner from Providence. Among the locations waiting to be explored you will find a gloomy Victorian residence, an abandoned hospital where forbidden experiments were performed, as well as a jungle inhabited by tribes performing secret rituals. Astral forces epitomised by the Great Ages, such as Nyarlathotep, Dagon, Shub-Niggurath, Azathoth and finally Cthulhu himself, play an important role in each plot line. These beings are so powerful that a mere human is not able to comprehend them with reason, so protagonists must be well prepared to confront them; otherwise they will go mad as soon as they see them. However, if equipped with the appropriate knowledge, they can retreat unavoidable, giving them at least partial resistance. In Lovecraft's Untold Stories the action is shown from the top-down perspective. During the game, players travel through scary procedurally generated locations, face different opponents (both cultists and various monsters), solve different puzzles, and finally find new items of equipment as well as improve the already owned ones. Moreover, during the game players make decisions that affect not only the further course of the story, but also the psychological state of the protagonist. Making the wrong choices gradually pushes them towards madness, with the ultimate result of committing suicide. In the game, however, it is possible to improve the state of mind of the protagonist; the authors also allow us to prepare him for the meeting with the Great Ancient One by collecting objects to increase the knowledge about these creatures. Each of the five characters features different aspects to mechanics. While a detective with an average amount of life and endurance is the most versatile hero, the more fragile professor specializes in ranged combat. The witch, on the other hand, can teleport and deal large amounts of damage to enemies, but is not very resistant to attacks. The thief handles melee combat quite well making use of the ability to act quietly. The list is closed by the ghoul, who also fights efficiently from a short distance, and also has a large number of health points, but can not use first-aid kits (his impaired forces regenerate themselves). 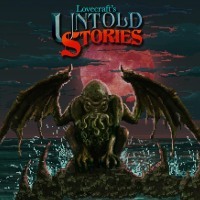 Lovecraft's Untold Stories deliver simple 2D pixel-art visuals. Thanks to scarce color pallette and gloomy stylistics, the creators managed to implement an atmosphere of horror, which is intensified by a disturbing soundtrack.